The top foreign and finance ministers of the European Union member states issued a joint statement on Nov. 2 repudiating the United States’ reimposition of sanctions on Iran, according to the British Embassy in Seoul. The statement gave credence to the Iranian position, which was issued by its embassy in Seoul. “We deeply regret the re-imposition of sanctions by the United States due to the latter’s withdrawal from the Joint Comprehensive Plan of Action,” said the report by EU High Representative Federica Mogherini and Foreign Ministers Jean-Yves Le Drian of France, Heiko Maas of Germany and Foreign Secretary Jeremy Hunt of the United Kingdom, as well as Finance Ministers Bruno Le Maire of France, Olaf Scholz of Germany and Philip Hammond of the UK. 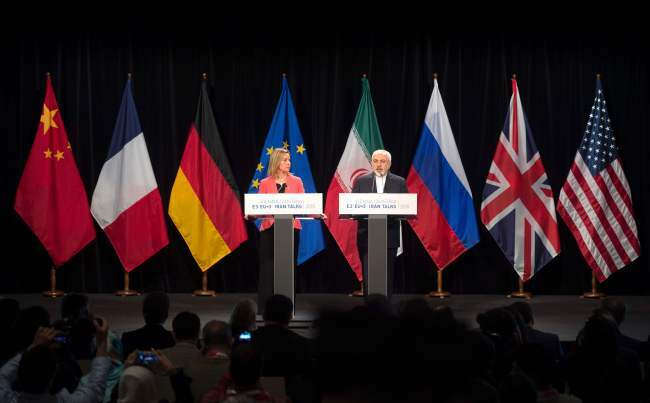 The JCPOA is a multilateral accord designed to curb Tehran’s nuclear program. It was reached in Vienna on July 14, 2015, between Iran and the five permanent members of the United Nations Security Council -- China, France, Russia, the United Kingdom and the United States -- plus Germany and the EU. Under the terms of the deal, Tehran agreed to limit its nuclear activities and submit to international inspections in return for the lifting of economic sanctions. US President Donald Trump pulled his country out of the agreement earlier this year, exerting the full force of US sanctions on the already battered Iranian economy. The package includes the threat to sanction companies or countries that purchase Iranian oil, the lifeblood of its economy. Noting that the accord also encompasses the lifting of international sanctions, the ministers emphasized that it had fostered positive trade and economic relations between Iran and the West, particularly improving the lives of ordinary Iranians. A special clearinghouse designed to allow European companies that trade with Iran to bypass the reimposed sanctions is to be set up in Europe within months, possibly in France or Germany, according to the Guardian newspaper. The mechanism, known as a special-purpose vehicle, is one of the ways the EU has sought to reassure Iran of its unwavering commitment to the 2015 deal centered on expanding commerce. Brussels said Russia and China -- signatories to the JCPOA -- as well as other supportive third parties will continue to honor the multilateral agreement. The special-purpose vehicle will enable the continuation of European business and trade with Iran, it added. The Iranian government decried Washington’s unilateral move in a statement. While condemning the US sanctions, Iran welcomed the EU joint statement as well as statements adopted by Russia and China, lauding their commitment to maintaining financial channels with Iran and ensuring the continuation of Iran’s oil and gas exports. Meanwhile, South Korean companies doing business in Iran have expressed jitters about the new developments, as uncertainty in trade and investment relations has increased. Korea is one of eight countries that have received waivers for doing business with Iran, although the exemption is temporary and strictly limited to oil. Under the waiver, Korean firms are allowed to continue imports of Iranian crude for 180 days from Nov. 5 on the condition they significantly reduce the volume of imports during that period. Currently, five Korean companies, including SK Innovation, Hyundai Oilbank and Hanwha Total, are importing condensate -- a very light crude oil -- from Iran. It is preferred by local oil-refining and chemical corporations due to its competitive price. Iranian condensate accounts for over half of the nation’s total condensate imports. Since May, when Washington first announced its plans to restore Iran sanctions, Korean companies have reduced imports from the country and diversified trading markets to include Saudi Arabia, Qatar and Mexico, among other economies.